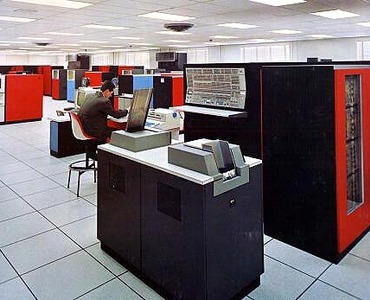 The IBM System/360 Model 75 is a discontinued high end / high performance system that was introduced April 22, 1965. Although it played many roles in IBM's System/360 lineup, it accounted for a small fraction of a percent of the 360 systems sold. Five Model 75 computers housed at NASA's Real Time Computer Complex were used during the Apollo program. Three models, the H75, I75 and J75, were respectively configured with one, two or four IBM 2365 Model 3 Processor Storage units, each of which provided 262,144 (256K) bytes of core memory, so that the H75 had 262,144 (256K) bytes of core, the I75 had 524,288 (512K), and the J75 1,048,576 (1 MB). The high performance of the Model 75 was attributed to half a dozen advanced features, including Parallel arithmetic, Overlapped memory fetch and Parallel addition for address calculation. Furthermore, independent storage sections provided two-way (H75) or four-way (I75, J75) interleaving of memory access. Even with only two-way interleaving, "an effective sequential access rate of 400 nanoseconds per double word (eight bytes) is possible." The Model 75 implements the complete System/360 "universal instruction set" architecture, including floating-point, decimal, and character operations as standard features. ^ a b "IBM System/360 Model 75 Functional Characteristics" (PDF). IBM. A22-6889-0. ^ An ADP Newsletter cited on page 56 in Weiss, Eric A. (ed) (1969). Computer USage Essentials. McGraw-Hill. LCCN 71-76142. CS1 maint: Extra text: authors list (link) says (re S/360) "75-91 .. 0.1%"
^ "IBM 100 Icons of progress: The Apollo Missions". IBM. Retrieved 2019-03-26. This page was last edited on 27 March 2019, at 03:42 (UTC).